I have some florist friends (know of other florists) who can only be described as amazing. What they can do with flowers, their vision in creating items that will blow your mind, never ceases to remind me that there is always something new to be learned (and even though I've been part of this world for 32 years I am still learning, every single day - I know, hard to believe when I'm still only 37 ;) ). To them floristry is easy; to me it wasn't quite so. I had to work at everything, force myself to think outside-of-the-box, practice, practice and practice to make sure I got it right. I could look at a single flower, leaf and piece of twig and see just what they are - leaf, twig and flower; the friends I've mentioned will take those 3 items and turn them into something which will make you say "wow" out loud to anyone who may (or may not) be listening. When I say I had to work at floristry, I mean I really had to work at it - hard. Nothing came to me naturally. Training to be a florist back when I set out on this path was also a lot harder than it is today (I'm sorry to those of you have recently qualified, or are in the midst of your training but it's true). Back when I was starting out I went to college 2 days a week, worked in a shop 4 days a week (a shop which at the time was also about 20 years behind the current floristry trends of the day). On my college days I was taught how to make something different each day (one half of which was spent learning the botanical side of plants and flowers) before being sent home again. At the end of the year I was set 2 exams - 1 written, 1 practical. The practical one we were given 3 hours to make 4 different items. Another year I was given 4 hours and 5 items. Failing on just one of those 4/5 items meant the whole year was failed, and you had to go back to the beginning and start again. It was slightly soul destroying to fail - I know this for a fact because I did fail one. For this particular exam I had to make 5 items in 4 hours. I had a traditional style bouquet, a tied sheaf (my nemesis) a wired wedding bouquet, based cushion tribute and a loose wreath. We may have only made those items once, way back at the beginning of the year - this didn't matter though; the rules were the rules. If we didn't complete all the items in the time, we failed. Thankfully, I had completed everything and I was extremely pleased with them all (especially the tied sheaf). Back then though, the examiners (who were not the people who had been teaching you every day - as they are now) didn't just look at your items from a distance to make sure you'd covered all the florist foam, didn't have any gaps in your basing work (which had to be level, smooth and compact - 1 small gap the size of a finger tip meant instant failure), checked to make sure you'd used the correct wire on every single flower which had a wire attached, while also looking to ensure everything had balance; oh no, back then they would also turn everything upside-down and shake it - vigorously. This is why I failed; 1 (that's just 1) flower head fell out of my wreath. Instant failure. All 4 other items I received a distinction for. That 1 flower head caused me a whole other year of grief and stress. These days they are taught how to make something, get all day to practice, are tested on it at the end of the day or the next. If they fail for any reason, they can remake their item up to 3 times until they get it right. I don't think I have heard of anyone failing a floristry exam in over 15 years now. The quality of some of the work being awarded distinctions these days would have been instant failures back when I trained, but that's a conversation to be had with people in charge of the industry - I'm here for reviews, although this does tend to lead someway towards the reason for this entry. 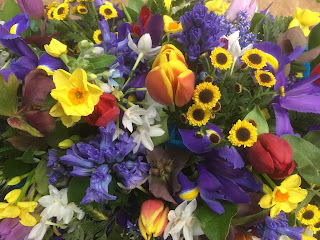 Floristry can be a very 'fickle' world to belong to; for every one great florist you meet, there will be 4 more in the background wanting to trip you up on a Saturday night - it really does seem to bring out the worst in some people (the best in other's). There are several world wide organisations aimed at florists, but your face has to fit to be accepted in (you also need to pay them quite extortionate amounts on a yearly basis). Others you can join (for a fee) which will allow you to promote yourself as a 'better' business, however these also tend to be very "cliquey" (similar to your face fitting but not quite so strict). Then there are the free ones - internet forums, google and facebook groups (I'm a member of several of these) which are great for putting like-minded florists in touch with each other. These also tend to be much friendlier, offer great advice, encouragement and support when you need it and I've been blessed to make some pretty amazing friends around the world via a few of them. Being on my own, in a shop tucked away around a corner, these groups have been invaluable to me and 99% of the time the people who comment know exactly what you are going through (having been there before) or can offer some great ideas on how to solve a particular problem. It's also lovely to be able to pass on my own titbits of wisdom to those younger florists just starting out, who (like me) may not find it quite so easy but want to be a florist above anything else. I would have given up when I was training had it not been for a lady called Janette who took over our class; her encouragement gave me the strength to keep going (in a way I owe everything I am and everything I have to her). I love being able to pay forward some of the hints and tips she gave me, to younger (newer) florists who might be struggling in the same ways I did. These groups are also great when people in the real world might tackle you when you are not ready for them. We live in a world where anyone (with a computer, phone, tablet and even games consoles) can leave reviews for businesses. Good reviews can make a business, bad can (obviously) destroy one (although not always - some people will specifically visit businesses with bad reviews to see if they really are as bad as other's have made them out to be). 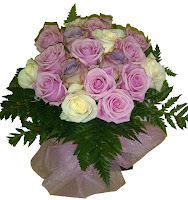 In this regard, I have been extremely lucky - in fact in just these past 5 days I have received 3 x 5* reviews on the web - 1 on google, 1 on facebook and another on a florist site where local shops and everyday customers can send orders to us online. On one of these forums the other day a fairly new florist was distraught as someone had left her a very negative review, even though the order had not been one of hers (turns out it was a local competitor of hers - never a nice thing to do and goes back to what I was saying above about faces not fitting!). She was having to jump though hoops to get it removed and was worried about how it would affect her business until it was removed - something I am sure we would all be concerned about if it had happened to us (I know I would be). Another florist then said "I wouldn't worry too much; any shop with just 5* reviews can't be trusted anyway. Leave it where it is, people are more likely to use you if you have some negative reviews". I found this a very odd thing to say and mentioned how I am so lucky that all but 2 of the reviews left for me on the web (those 2 being a florist for one who never left a reason why only 4 stars, and a customer who also gave us 4 because he didn't think we offered enough choice and options on our website for sale) have been 5 stars and how proud I am of each and every one of them. I've worked hard for those great reviews - blood (often there is blood from those knives and sharp scissors) is spilled, sleepless nights occur with way too much regularity and grey hairs spring up hourly. I love that my customers have taken the time to say such lovely things about the shop (and some have said nice things about me too :) ) and having not always found this business the easiest to be a part of they really do mean the world to me. Don't get me wrong, I don't always get it right, have made mistakes (I'm only human after all) but they just add to my being proud at the reviews, because it shows that I am still working hard to get-it-right.